Product #2797 | SKU SAQ7VP | 0.0 (no ratings yet) Thanks for your rating! From Samson , this Dynamic Microphone System is compiled to deliver an affordable solution for musicians, schools, halls, project recording studios, small sound reinforcement applications, etc. 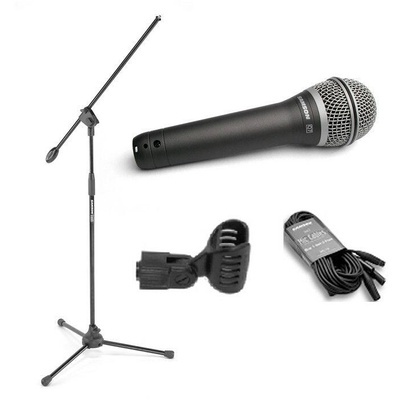 This convenient package includes the Samson Q7 dynamic microphone, boom stand, low noise cable, 12-foot cable, mic-stand clip and storage bag. The Samson Q7 features a super-cardioid polar pattern resulting in excellent feedback and noise rejection. The linear frequency response results in accurate reproduction of vocals and instruments. The boom stand is ideal for recording applications, the boom can be removed from the tripod stand for use on stage. In all, the package provides a suitable all-in-one solution for anyone requiring a simple, hassle-free microphone system. Providing all the necessities, the Complete Dynamic Microphone system is a hassle-free solution for anyone who requires a microphone system on stage or in studio. The heart of the Q7 capsule features a Neodymium element that provides exceptional output gain while minimizing output noise.